Geisha Wonders is a progressive jackpot pokies game running on the NetEnt wide area progressive network. Although this is an older game, it remains hugely popular with online players today thanks to its tranquil design and potential to offer up some big wins. Find out how to play Geisha Wonders for real money at the best casinos on the Web. 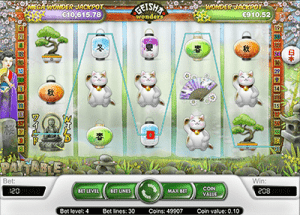 Geisha Wonders is a Japanese themed pokies game, where the reels are set against a tranquil oriental garden filled with blooming cherry blossoms and bamboo. The symbols are made up of all kinds of Japanese iconography, including paper lanterns, fans, koi fish, bonsai trees, tea pots and maneki-neko (the waving cat known to bring good luck). A soothing soundtrack of Japanese music adds to the authenticity and gives this game a nice relaxed feel. On the surface it’s a fairly straightforward game, but it comes with a couple of bonus features plus two separate progressive jackpots, which is what has solidified Geisha Wonders as one of NetEnt’s most popular online pokies. Geisha Wonders is an instant-play game from Net Entertainment, so it can be played at any of the recommended casinos in the table above directly over your Web browser without having to download any software. Sign up for an account using our links to get access to some exclusive welcome bonuses. You can then try Geisha Wonders for free in practice mode or make an instant deposit to your account to start playing for real money. 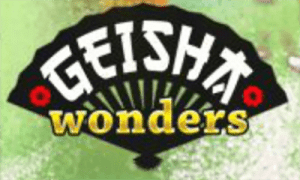 Geisha Wonders is a five-reel, three row video pokies game with 30 adjustable paylines. To play, use the green buttons at the bottom of the reels to set the size of your desired wager, selecting a bet level between one and four, a coin value between 0.01 and 0.10 and the number of paylines you wish to activate between one and 30. The minimum bet in Geisha Wonders is a low $0.04 while the maximum bet is capped at $12.00. You can also choose to set the auto-play feature, having the computer place up to 1000 spins on your behalf. Wild symbol – The Buddha acts as the games wild symbol, substituting all other symbols to form a winning combination except for the scatter and jackpot symbols. 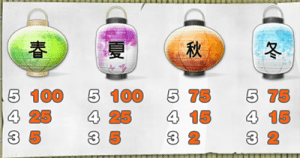 Scatter symbol – The scatter is the geisha symbol which is responsible for triggering the free spins bonus. All scatter wins pay the bet total plus a multiplier. Free spins – Three or more scatter symbols anywhere across the reels trigger free spins. Three scatters will give you 10+ free spins, four scatters will give you 20+ free spins and five scatters will award a whopping 30+ free spins. All free spin wins are doubled. Progressive jackpots – There are two progressives in Geisha Wonders, the Wonder Jackpot and Mega Wonder Jackpot. The jackpots are triggered by an appearance of either four or five gold stars which attach themselves to standard game symbols. The current total for each progressive is listed in a box at the top of the reels as you play, and you can watch as the jackpots grows before your eyes. The more you bet, the higher your chances are of winning one of the progressives. Geisha Wonders is wildly popular and can therefore be found at a majority of all leading NetEnt and multi-provider casinos. As an instant-play game, it’s easily accessible and compatible with both PC and Mac users over Safari, Chrome, Firefox, Edge or any other Web browser. Play Geisha Wonders for free or real money bets at any of the top rated casinos in our table above, or head straight to Slots Million, our number one rated casino to play NetEnt’s progressive jackpot pokies. There’s something delightfully soothing about Geisha Wonders, with its pastel colours and percussion based background music, which balances perfectly with the prospect of hitting one of those sweet, sweet progressive jackpots. It’s an exciting game without being too in your face, and is well suited to players who shy from pokies full of flashing lights and over the top sound effects. While the jackpots are nowhere near as lucrative as games on Microgaming’s progressive network, there’s still some good money to be won here, usually upwards of the $10K mark, so Geisha Wonders is well worth a try.